I already have two kilts in my clan tartan: an Ancient Colquhoun 8-yard knife pleat (Lochcarron cloth), and a Reproduction Colquhoun 8-yard knife pleat (DC Dalgliesh cloth). They are both nice kilts in colour palettes I like. But I've always thought that I should own a kilt in Modern Colquhoun tartan with its dark colours. I'm not sure why I think I need one, except that it's an official version of the clan tartan, and probably the most recognised. It's the least exciting version to look at, and I really don't think it would ever excite me enough to want to wear it over the others ...unless I made something else about the kilt more interesting. 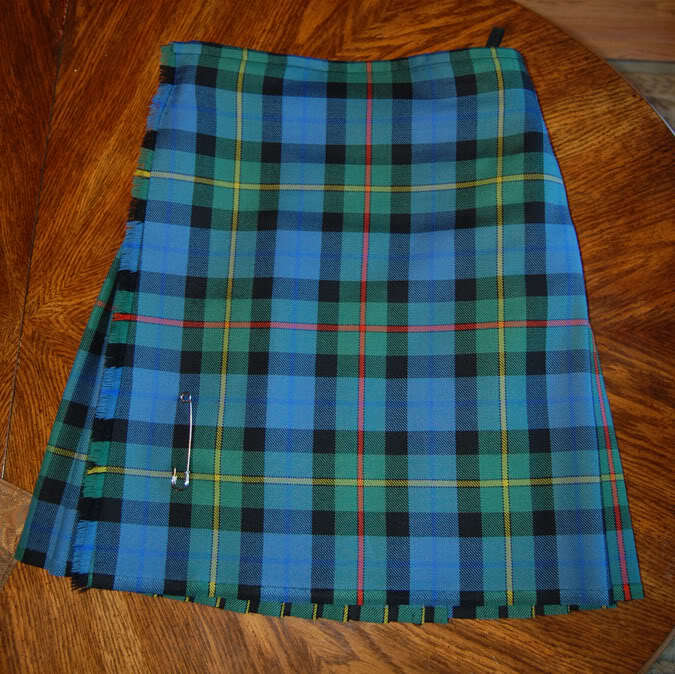 So on that note, I have been wondering what would make me want to wear a kilt in the Modern version of this tartan. I have developed an appreciation for high-rise military box pleated kilts (MBP). I have a QOH military kilt that I enjoy, but it's not my clan tartan. So why not get a kilt made that combines the two? Normally I'm not one for dark tartan setts. The older regimental versions of Black Watch, Gordon, MacKenzie, etc., use blues and greens that are barely distinguishable from the black. The only colours that stand out are the white, red, or yellow stripes. And they pleat them very narrowly to these stripes. So using that same visual style, I would take the dark sett of Modern Colquhoun and pleat it to the central red stripe with typical narrow military box pleats. I would want to have it made just like the older regimental kilts with a 3" rise, double-prong buckles, and a green top band and hanger loops. For comparison, here's my QOH kilt showing the pleating, straps, and green band. 1. Who makes the darkest version of Modern Colquhoun in standard cloth (no custom weaves)? The image above is based on Lochcarron. 2. Who makes the largest sett? Military tartans tend to have huge setts, and I might like to use the largest one I can find, if it's dark enough. 3. Which kiltmakers offer traditional military box pleat kilts in non-military tartans? 4. Is there something I'm forgetting or misunderstanding about military kilts that wouldn't work here? 5. Is this a stupid idea? Last edited by StevieR; 8th November 18 at 03:00 PM. I think that will look great... Curious to see how dark a colorway and how large a sett size is available. I like the idea of the green waistband as well. It has a large set size, as can be seen from the front (notice that there's only a single red stripe on the front apron!). Last edited by ShaunMaxwell; 8th November 18 at 03:13 PM. I think this is a great idea. Go forth! Last edited by Tarheel; 9th November 18 at 05:52 AM. StevieR, thanks for the pointer to Paul Henry. Any other makers out there who can do it in the regimental style? Keltoi used to make them, but only in a limited range of tartans, and I don't think John Hart is still working. I seem to recall that Steve Ashton works on regimental kilts for repairs, but I don't see that he offers them as regular builds. I guess I should enquire with him. Does Barb Tewksbury do regimental kilts? I've done a custom weave before. The price and wait are not ideal, so it wouldn't be my first choice. But as a last resort, I suppose it's an option that could still be on the table. I'd like a really heavy cloth, though, and DC Dalgliesh is on the lighter side. Really, I'd like a 22 oz hard tartan, but that's apparently not possible. Yes, eight months or so for my tartan. I thought it worth the wait though. House of Edgar might be your best bet then - they produce “Regimental “ weight cloth and I know they have woven to order before, also I believe they will leave the cloth “in the grease” if you’d like. I’ve no idea what their minimum run might be though. Again, thanks StevieR! That's getting me closer to some realistic options. It looks like their regimental weight cloth is 17-18oz and is of course only available in a few regimental tartans. Oddly enough, their "heavyweight" 16oz clan tartan offerings don't even include Colquhoun. They only have Colquhoun in a 13oz cloth. Doesn't matter, though - I'd be looking at a special weave for the regimental weight anyway. I'd probably have to work with a kiltmaker first and let them handle the order with the weaver to get pricing. If there's a ridiculously large minimum run, it might kill the whole idea. I suppose I need to refamiliarise myself with the technical details of the selvedge too. As I recall, my Ancient Colquhoun in Lochcarron Strome has a tuck selvedge. My Reproduction Colquhoun from DC Dalgliesh has a natural "kilting" selvedge that's sort of wavy-looking. A herringbone selvedge appeals to me, just for the sake of being different, but I'm not sure which weavers offer that type. I have a Robertson Hunting with Lochcarron’s cloth. I’m very happy with the cloth, but I believe House of Edgar’s produce a superior selvedge. I may be wrong, but I think Andrew Elliot Ltd is the only commercial weaver offering a herringbone selvedge - but you might be restricted to 16oz weight? Of course, Figheadair is the real expert, hopefully he’ll chime in soon! Last edited by StevieR; 9th November 18 at 09:43 AM. If you want a MBP kilt pleated to the red stripe go for it. I’ve not done my kilts in anything but pleated to the sett, I considered it but John at Keltoi said that my tartan choice MacDonald ancient clan was not pleatable to a stripe, it could be done to the block so we pleated to the sett. However I did have him do it in the Kinguisse pleating style for something different. It’s always interesting seeing a kilt pleated to the stripe as it look so different coming and going. When I read your post, I thought to myself, "Huh? How could any tartan not be pleatable to a stripe?" Then I looked at the MacDonald tartan. I get it now. There's not really a lone stripe to pleat to. Any of those red stripes have a narrower paired stripe that would make it an unbalanced look for a pleat. So yeah, you made the right choice pleating to the sett. My Ancient Colquhoun kilt is pleated to a non-stripe, so the back of the kilt doesn't show any vertical stripes. It's only horizontal stripes, with the "lawn chair" effect. My Reproduction Colquhoun kilt is pleated to the sett. 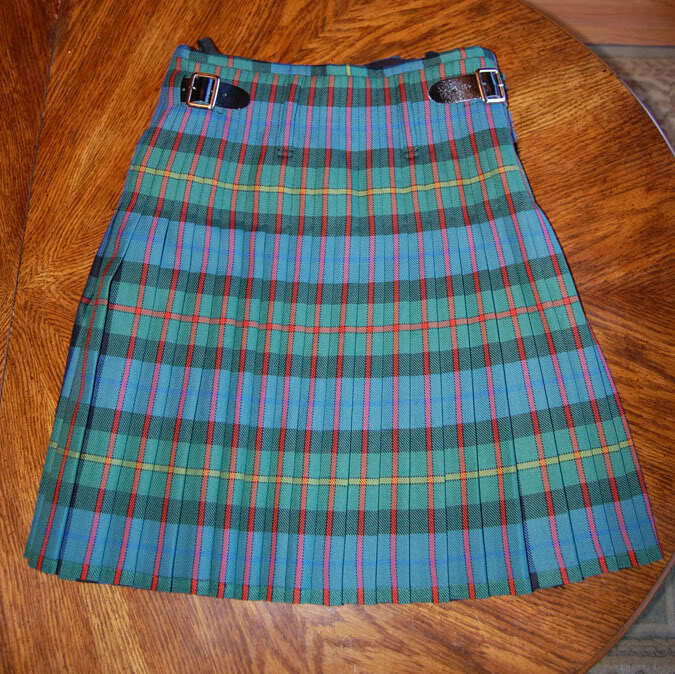 So I figured pleating to the red stripe, military-style, would be a nice variation from my other kilts. Having looked at the way it comes across on the Atholl Highlanders kilts, as well as Shaun's kilt above, I think it'll look grand. Since I occasionally envy those who have a lot of red in their clan tartans, this is the only way to pack a lot of red into one of my Colquhoun kilts.